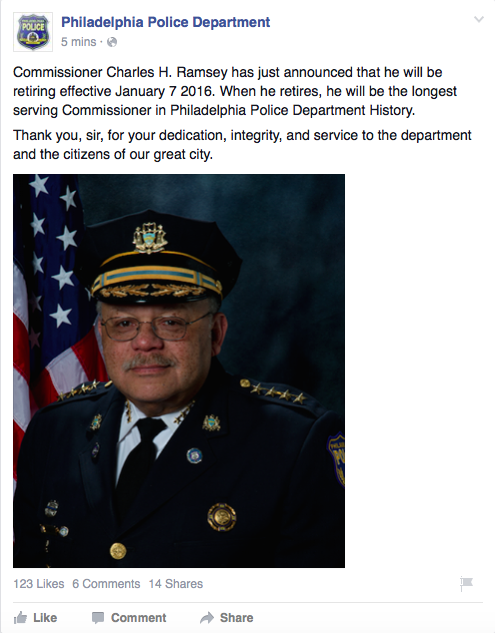 Philadelphia Police Commissioner Charles H. Ramsey announced Wednesday at City Hall that he intends to retire just after the new year, saying it is time for him to move on to another level. "It's been a good ride," Ramsey said. "I've been blessed." Ramsey, 65, came out of retirement to head the Philadelphia Police Department after Mayor Michael Nutter was elected in 2007. When he steps down on Jan. 7, Ramsey will be the longest-serving commissioner in department history. "I've been at this a long time," Ramsey said. "I'm not tired. I'm not burned out. In fact, I'm actually in my prime. There's a lot of things I'm still trying to do in the area of policing, but it's time to move to another level. I think I can have a great impact nationally on many of the issues that are facing law enforcement today." Ramsey first retired in 2006 after serving eight years as the police chief in Washington. But Nutter encouraged him to come to Philadelphia, where violent crime fell significantly during his eight-year tenure. Nutter recalled the first time he met Ramsey at Union Station in Washington at the suggestion of a longtime friend. Nutter said he left Washington with a "positive feeling" and feeling impressed at Ramsey's efforts to combat crime in Washington and in his native Chicago. Eight years later, Nutter choked up Wednesday morning as he thanked Ramsey, sputtering his gratitude in sentences interrupted by sobs of tears. "Thank you for saying yes. Thank you for coming to Philadelphia," Nutter said. "Thank you for making my city a safer city. Children and adults of my city owe you a tremendous debt of gratitude. There are young people alive who 10 years ago might not have lived in your city but because of you." Philadelphia's homicide rate has fallen 33 percent compared to this time in 2007, Nutter said. The number of shooting victims has declined by 27 percent. Robberies have decreased by 33 percent and burglaries have dropped by 26 percent. Ramsey called the diminished crime numbers his proudest achievement during his Philadelphia tenure, but stressed there is more work to be done. He said some neighborhoods remain "far too unsafe" and acknowledged their relationships with police could improve. "That job isn't finished," Ramsey said. "We do have a lot of pockets that need additional attention – but not just policing. There are other factors there. You can talk about poverty. You can talk about education. You can talk about a lot of things." Philadelphia police are working to implement dozens of recommendations included in a Department of Justice report released earlier this year. That report, requested by Ramsey in 2013, found the department's use of lethal force had "serious deficiencies" and was in need of broad reform. The report found that officers opened fire nearly 400 times during an eight-year stretch, mostly at black suspects. The report recommended changes to police training, improved investigations of police-involved shootings and greater public discourse. "It was critical, there's no question about that," Ramsey said. "But if I thought everything was running on all cylinders I never would have asked them to come in and take a look. I knew we had issues, but when you're close to something, you don't always see everything you need to see. "Having that third-party come in and take a look is important. The mayor appointed an oversight committee to monitor our progress. ... They've done a very good job of keeping us on track and asking us solid questions and providing very valuable feedback." Ramsey has spent 47 years working in law enforcement. Prior to heading Washington's police department, he served as an officer in his native Chicago, where he ascended to deputy superintendent. In Philadelphia, Ramsey's policing achievements caught the eye of President Barack Obama, who tapped Ramsey to co-chair his Task Force on 21st Century Policing following the civil unrest in Ferguson, Missouri last year. "Philadelphia is, was and will be very, very lucky to benefit from the talent and dedication of Police Commissioner Charles Ramsey," Nutter said. "He's nationally and internationally recognized among his law enforcement peers." Ramsey said others can determine his legacy. He said he simply hopes to hand off the department in a better state than he found it. "You're always handing off to someone else who is supposed to take it a little bit further and further and, hopefully, achieve the kind of safe communities that we all want to see," Ramsey said. First Deputy Commissioner Richard Ross is among those considered a leading candidate to replace Ramsey. A Philadelphia native, Ross has held various positions since joining the department in 1989. "I couldn't agree more that he is capable of running this department," Ramsey said. "If he doesn't run this one, he'll run one somewhere else. That's the kind of talent the man has. "Having said that, it's not my choice. It's not my decision," he said. "But I'm not the least bit shy to say that I've been around a lot of police leaders ... I can tell you right now there is nobody out there in this country any better than who we currently have in our departments." The Daily News speculated that SEPTA Police Chief Tom Nestel could also emerge as a candidate. Ramsey said his decision to retire was a personal one and not influenced by politics. Democratic mayoral nominee Jim Kenney likely will succeed Nutter in office next year barring an epic upset by Republican Melissa Murray Bailey. "I think the new mayor needs to be able to pick his or her own team and hit the ground running," Ramsey said. "There's a lot of talent inside our department, if that's what they choose to do. It's just time." Kenney previously has praised Ramsey on the campaign trail, listing him as a candidate to serve as police commissioner in his administration. That praise came despite different philosophies on stop-and-frisk policing, a controversial tactic used under Ramsey. Kenney did not issue any remarks on Ramsey's retirement. Campaign spokeswoman Lauren Hitt said Kenney would let Nutter's comments stand. "We feel like today is the day to honor Commissioner Ramsey's service and his sacrifice to the city," Hitt said. John McNesby, president of FOP Lodge No. 5, lauded Ramsey for leading the police department in "a really solid way." He particularly praised Ramsey for reaching out to the surviving families of eight police officers killed in the line of duty during his tenure. "I can't see him staying retired," McNesby said. "It's in his blood. Wherever he lands in the future, it will be an asset to that organization. He did a lot of good things. Sometimes we agreed; sometimes we didn't. We always worked it out professionally." McNesby said he hopes the next police commissioner will maintain a "good line of communication" with the FOP and not take any disagreements personally. He pushed for the next mayor to appoint someone within the department, heralding Ross as a respected "straight shooter" who would make a strong candidate. "I think you need to take a good look inside the department," McNesby said. "We have a lot of good commanders who have invested a lot of time and and a lot of energy. You can find good talent here." The Philadelphia Police Department thanked Ramsey in a Facebook post Wednesday. Come the new year, don't expect Ramsey to just kick back and relax. "I've got more to contribute," Ramsey said. "Like I said before, I'm not ready to stick up my heels. The time will come in my life when all I can do is stare out the window. But it ain't today."